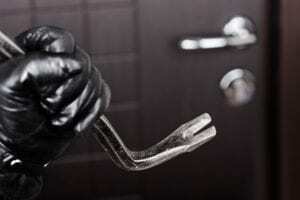 There are two kinds of burglars that your home needs protection against; the first is the professional burglar who is adept at what he or she does; the second is the opportunist type who is usually an addict looking to find a score for his or her next drug experience or kids looking for an adventure. There is some commonality in how they operate and that you need to take action so that their plans to burglar your home fail. Both types want to get in and out of your home undetected and with some worthwhile loot. Before we look at ways to prevent burglary, let’s take a minute to understand what burglary is. It is the unlawful entry to a building with the intent to commit a crime. So, burglary is not always involving theft of property, though most folks assume that it is. In actuality, a burglar may enter a premise with the intent of vandalizing it. To prevent a burglary there are precautions you should take. If you are a homeowner there is a good chance that your garage is filled with so much stuff you don’t use it to garage your car. Nevertheless, you most likely have a remote garage door opener in the car parked in your driveway or on the street. All a burglar needs to do is get ahold of the remote, open the garage door, close it behind them, and enter your home to rob you. So, keep your cars locked even in the driveway and hide the remote in your console or glove box. If you don’t use the garage for your car, take the opener out and keep it locked up in your home. As the garage is a favorite way of breaking into your home, make sure the window(s) if any, are locked. Also, install a high-quality lock on the garage door into your home. It is also important to keep your garage door in good working order. If it only goes up a little ways or is stuck in a partially open manner, it is an invitation to a burglar to enter. When away, put timers on interior lights so it appears as if you are home. Ask a neighbor to bring in your mail each day too. To protect you and your family from intruders, install motion activated flood lights on the exterior of your dwelling – when activated, a burglar will think you’re at home even if you aren’t. Get a dog. Barking dogs make noise and discourage burglars from trying to enter your home. Alarm technologytoday is inexpensive and better than ever. Many cable TV providers and cell phone providers offer excellent quality systems that are affordable with monitoring. The beeping alarm or siren going off along with a signal sent via cell technology gives you a system that has no lines to cut and can be armed from anyplace you can connect your smartphone or tablet.